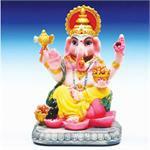 Ganesh removes obstacles, protects entry ways, brings good luck and prosperity. Sold as a curio only - no magickal effect is guaranteed. Hand-painted Waterproof Resin Statue 4"